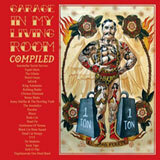 Beast Records - GARAGE IN MY LIVING ROOM Compiled! GARAGE IN MY LIVING ROOM Compiled! Do you know Wout Fransen? You should! The man deserves the deepest respect ever. Figure it out: twice a year and even more he moves out everything from his house to welcome the best freaky garage bands touring across the earth. Garage In My Living compiles those bands: Interstellar Secret Services, Equal Idiots, The Glücks, Weird Omen, MOAR, King Automatic, Robbing Banks, Chicken Diamond, Bones Shake, Jonny Halifax & The Hwoling Truth, The Anomalys, Escobar, Roda Lits, Head On, Gentlemen of Verona, Black Cat Bone Squad, Dead Cat Stimpy, YVY, De Stekkers, Sects Tape, Hell-O-Tiki, Tequilasavate One Dead Band.